The provision of a high-capacity, fast and robust broadband and WiFi service is crucial for the success of today's multi tenant buildings. Including purpose built student accommodation, build-to-rent developments and purpose built shared living schemes. Here are six questions you should be asking your supplier to ensure you are meeting the demands and expectations of all prospective tenants. Do they understand the connected living and content preferences of your target demographic? Do they understand the inclusive service preferences of your target demographic? Are they able to provide a robust WiFi Service Level Agreement? Do they provide residents with their own private wireless networks to enable the use of smart devices and systems, from anywhere in the building? Are they able to provide seamless coverage in individual dwellings and in shared amenity spaces? How is the service delivered to ensure tenants can achieve the package speeds advertised and the best possible connectivity experience? 1) Does your ISP understand the connected living and content preferences of your target demographic? The majority of this group will fall into the ABC1 demographic classification. This means use of the Internet is deeply embedded in their lifestyles and they have particular expectations about the services they should be able to access and the types of smart devices they should be able to use in their accommodation. For this group the provision of high-speed broadband (defined as service of at least 100MB/s) and WiFi is an essential requirement. This fact is supported by ASK4’s own research amongst current 14-16 year olds and 18-23 year olds (the likely tenants of BTR buildings currently in planning and for delivery from 2019), for whom the provision of WiFi is a near universal requirement to support a myriad of devices that can only connect to the Internet wirelessly. ASK4’s proprietary research also identifies the attitudes of these groups towards content services. In the 18 – 23 age group, 83% of individuals have at least one streaming service subscription (Netflix, Amazon Prime etc. ), whilst only 9% regularly use a premium broadcast service (Sky or Virgin Media). In the 14 – 16 age group the position is even more acute with 87% regularly consuming content via streaming services via set-top-boxes (Apple TV, Google Chromecast etc.) 92% of the 14 – 16 age group use a Smart TV multiple times a week. Given the above, ASK4’s position is that the principle mechanism by which target build-to-rent / purpose built shared living tenants will consume content is via the Internet. 2) Does your ISP understand the inclusive service preferences of your target demographic? According to research by KnightFrank*, 62% of current 18 – 24 year olds would prefer to pay all bills and amenity costs within their monthly rental payment. With an inclusive broadband service, a building operator pays a service provider for service on behalf of tenants and service is delivered free at point of consumption. In this case, the building owner assumes at least a perceived responsibility for the service in the eyes of the tenant (irrespective of the strict contractual position between building owner, service provider and tenant). Consequently, the building owner has a clear interest in ensuring the inclusive service meets the needs of tenants through technical due diligence backed by robust contractual protections, including a Service Level Agreement. 3) Is your ISP able to provide a robust WiFi Service Level Agreement? In a fully managed WiFi service, a single party undertakes design work and plans wireless access point locations, antenna selection, channel allocation, power management configuration etc. in order to achieve seamless coverage in a building (in part or in whole) in accordance with a pre-agreed technical specification. A properly implemented managed WiFi installation, as provided by ASK4, can deliver service to all tenants to an agreed standard backed by a Service Level Agreement. An unmanaged WiFi implementation is one in which there is no prior planning of the location or transmission characteristics of the wireless access points in a building, nor cooperation between said access points - either because the single service provider responsible for providing the access points does not undertake such planning (e.g. Hyperoptic, Virgin Media) or because individual tenants procure their own broadband service from a generalist broadband provider (e.g. BT, TalkTalk, Sky etc.) and wireless deploy access points in an ad hoc fashion. 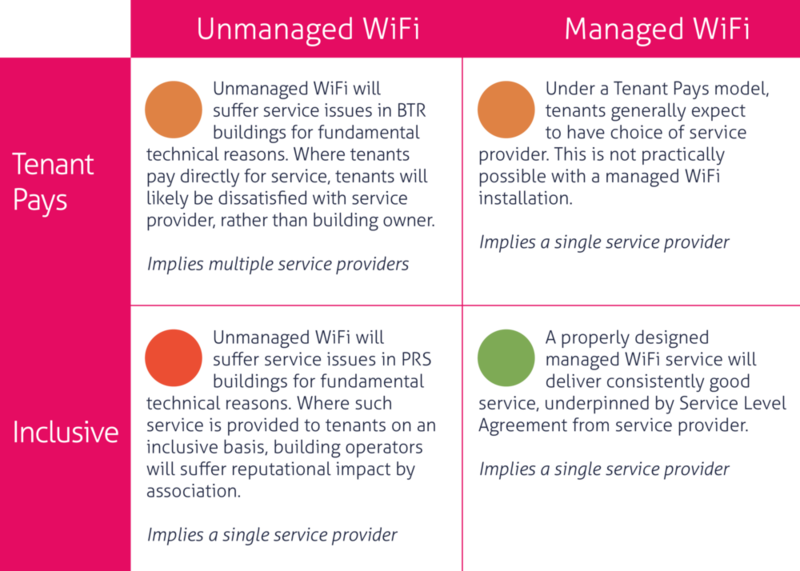 Unmanaged WiFi implementations in multi-tenant buildings are proven to suffer from service issues due to fundamental technical limitations. Essentially, WiFi operates in a limited radio spectrum and in an unmanaged implementation, access points compete for that spectrum which degrades performance for all users (for more details please speak to a member of the ASK4 team and ask for a copy of the ASK4 WiFi in Build to Rent Accommodation Technical Guide). It therefore follows that it is impossible for an unmanaged WiFi installation to benefit from a Service Level Agreement, which should be a mandatory requirement for an inclusive broadband service. 4) Does your ISP provide tenants with their own private wireless networks to enable the use of smart devices and systems, from anywhere in the building? One of the consequences of a managed WiFi service is the choice to provide a single shared wireless network (SSID) OR multiple separate wireless networks (separate SSIDs). Where multiple separate SSIDs are made available, a significant proportion of the entire capacity of the wireless network can be consumed in simply in broadcasting the availability of the various networks. This is problem made more acute when multiple adjacent wireless access points share a channel (which is unavoidable in a real-world deployment). Even where there is no overlap between wireless access points, broadcasting just 10 SSIDs consumes over 30% of available network capacity, rising to 97% of available capacity where three access points overlap (i.e. the network will fail to function). The correct solution is to provide one shared wireless network (or a limited number of networks – for example, one for tenants and one for staff). One of the consequences of this is the need to use Layer-2 isolation to separate all devices in the network in order to ensure devices are secure both from malicious attack and virus propagation etc. However, one of the constraints this necessarily imposes is the need to segregate all devices, including all of a user’s own devices, giving each access to the Internet, but stopping them connecting to each other. Historically, this security model was effective and reasonable and had few practical implications for users, as the vast majority of devices (PCs, laptops, tablets etc.) simply connected to the Internet. However, with the rise of connected devices such as wireless printers, smart TVs, wireless speakers and so on, all of which rely on the use of a wireless network to connect with other user devices (e.g. laptop to wireless printer, smartphone to wireless speakers), this security model imposes real limitations on users, stopping them using many common devices and services. Our primary research amongst the future tenants of BTR developments tells us that 76% have one or more such devices which they expect to work in their future accommodation buildings. ASK4’s exclusive, award-winning proprietary 4Network technology is the solution to this challenge. It allows us to preserve the benefits of Layer-2 isolation between users, whilst permitting all a user’s own devices to communicate together. 4Network is an industry first and forms a unique part of ASK4’s network infrastructure. 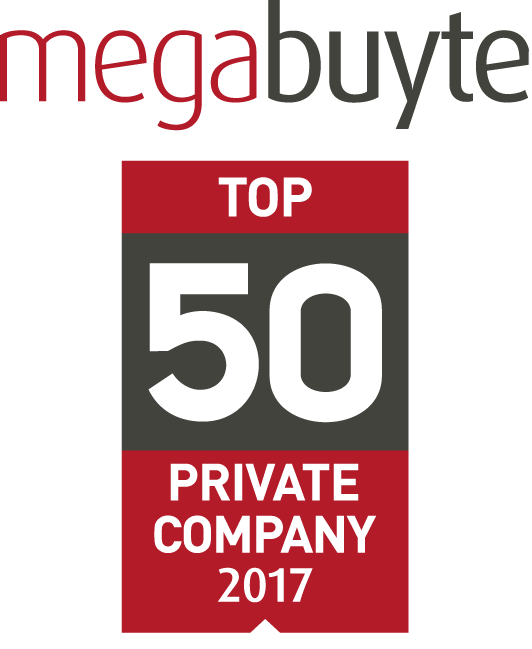 It is the result of significant investment and expertise, and is an innovation perfectly attuned to the needs of our customers. 4Network is also ASK4’s response to the influx of new WiFi connected devices, entertainment systems and infrastructure now available to tenants and accommodation operators. > You can read more about 4Network and how it works here. 5) Does your ISP provide seamless coverage in individual dwellings and in shared amenity spaces? One of the benefits of a managed WiFi service is that it allows accommodation operators to provide seamless WiFi connectivity throughout a building, including laundry areas, gyms, dining areas and social spaces. With 4Network, a tenant’s own private wireless network is also maintained wherever they are in the building. A managed network also allows for the running a key building systems, like CCTV, door locking systems and other ‘smart’ infrastructure. 6) How does your ISP deliver their service to ensure tenants can achieve the package speeds advertised and the best possible connectivity experience? We ensure the line delivering connectivity to a building is able to support the package speeds advertised to each tenant. The ASK4 service as a whole is delivered using the latest, ‘best in class’ infrastructure and technical expertise to provide the best possible connectivity experience throughout multi-tenant buildings. We have also invested heavily in our network to ensure that it meets the needs of users both today and in the future. We are a tier-2 ISP and operate the UK’s fastest multi-tenant residential network with core points of presence (PoPs) in Sheffield, Nottingham, Leicester, London, Reading, Bristol, Leeds, Birmingham and Manchester, our own Data Centre and an edge network connecting forty cities. We own and operate our own tier-3 Data Centre facility in Sheffield. Our core PoPs are interconnected using diversely routed dark-fibre, which gives us both capacity and redundancy and the ability to increase capacity as needed. Today the core network is lit at 100Gb/s and we have 5 wavelengths of contracted additional capacity, giving us significant capacity for future growth. Our edge network also makes extensive use of dark fibre, making ASK4 connected buildings the best-connected multi-tenant accommodation in the country. Our network connects to the wider Internet via multiple independent transit connections in London and Manchester and via settlement-free peering with other networks. ASK4 service users therefore gain access to our own high-capacity, highly available optical network, optimised for their unique requirements, including content caches from leading content providers (e.g. Netflix, Amazon Prime, Now TV) to ensure the very best possible viewing experience all of the time. If you have a build-to-rent development project, please get in touch - we would love to talk to you about it.